Not bad. The other one, V.Col, I think it's called, is honestly really good. Just to be able to carry a story (The Two Strangers, was it?) forward so well is commendable. I have an award for you on my site, check it out over there. The rules can be a little confusing on the award. Hey!It's a cool blog.Pretty informative with all the ramblings expected at the age.Good going! But yeah,on this particular post, I prefer the latest IE version, Safari bored me, and Chrome troubled me.So I keep coming back to my highly personalised IE. If you don't want to post it that is fine. I gave you the award because I appreciate you being a reader. I will be posting some veg soon. You can post on blog roll if you like. 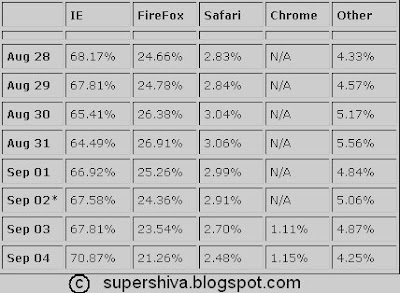 hey i use ie7 and opera,but i dont get slow start ups in opera nor any frequent crashes.